ALLEGRA BOVERMAN/Staff photo. Gloucester Daily Times. 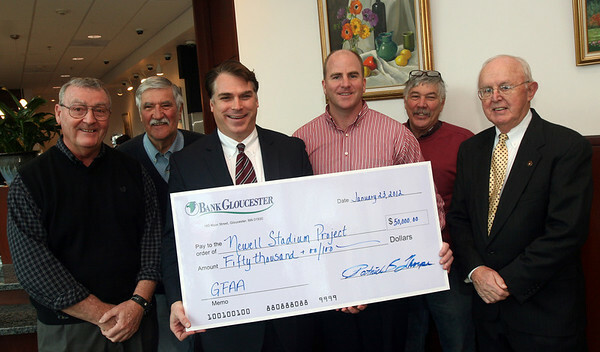 Gloucester: BankGloucester has donated $50,000 to the Newell Stadium renovation project. On hand to receive the donation on Monday afternoon from BankGloucester President Patrick Thorpe, third from left, are, Gloucester Fishermen Athletic Association members David Amero, Roger Corbin, Jim Philpott, Jonathan Pope, and Robert Muniz, chairman of the board of directors of BankGloucester.